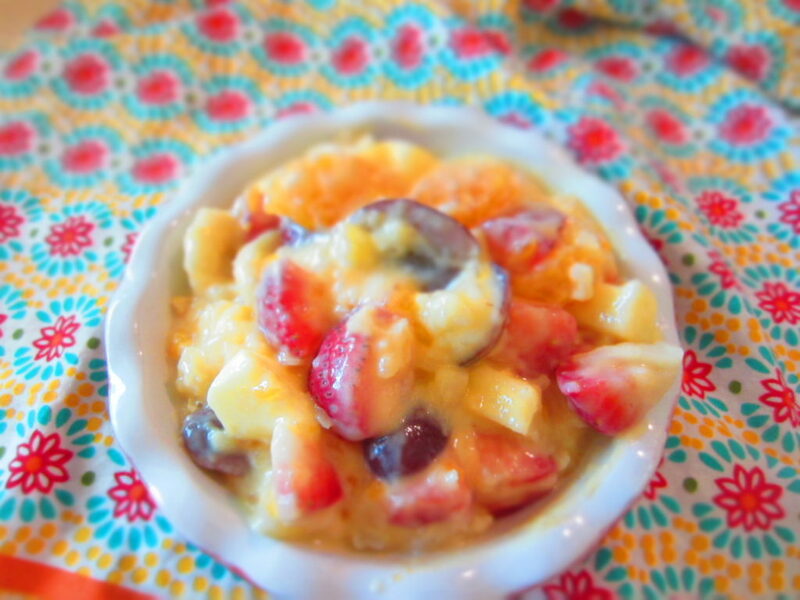 This dessert fruit salad can be ready in less than 20 minutes! Strawberries, bananas, oranges, apples, and pineapple mixed together with a creamy pudding! My mom always used to make a fruit salad, when I was growing up, that was so delicious. Of course I say “always,” when really it probably wasn’t all that often! It made an impression, that’s the point! All fruit salads are delicious, but this one was above and beyond…probably because it had pudding in it. It was definitely more of a dessert salad, and everyone loved it! I found out that it all derived from my great aunt (no surprise there, she’s amazing at everything she does, and particularly at all things kitchen related). My mom sent me the recipe so I could share it with you all! Well, it turns out that I didn’t want to spend as much time as she did on this little fruit salad. Cooking and cooling pudding plus chopping fruit and some other things…what? It just wasn’t the amount of time I was wanting to spend. So I experimented some and came up with a kind of dump and stir type salad that fulfilled my childhood craving. I decided to just go with a mixture of my favorite canned and fresh fruits. I opted for crushed pineapple instead of pineapple chunks because I wanted the pineapple flavor in every bite. So that’s just a preference thing. Whether you go with chunks or crushed, make sure to dump the juice and the fruit into the bowl. NO DRAINING NECESSARY!!! I simply combined a can of mandarin oranges and the crushed pineapple with the fresh fruit. Next I poured the dry pudding mix into the bowl. There is enough moisture in there with the juice from the canned fruit that it will smooth out and become normal pudding consistency. Then I put in some plain Greek yogurt to cut the sweet just a little bit. If you don’t have plain Greek yogurt on hand, sour cream would also do the trick just fine. IT TURNED OUT AMAZING! My son, husband and I loved it. It doesn’t look the prettiest, but it certainly makes up for it when you taste it. Like really, can you go wrong with fruit and vanilla pudding? I didn’t think so! So my new (and not necessarily improved…just different) version of the salad is what I am sharing with you today. Enjoy! Cut fresh fruit into bite sized pieces, combine fresh fruit with un-drained canned fruit. Add dry pudding mix and yogurt. Combine until pudding has been absorbed by fruit juices and yogurt is distributed throughout. Serve immediately or refrigerate to serve later. NOTE: If you choose to put in other canned fruit (like peaches or mixed fruit) go ahead and drain the extra liquid out of the can. If you choose to omit the pineapple or mandarin oranges, replace it with another type of canned fruit. You need juice from two cans of fruit. *You can use pineapple chunks, un-drained, if you prefer.